Neres Restoration, offers quality masonry services, including the maintenance, restoration, and tuck-pointing of brick, stone, and block. We are experienced masonry professionals providing high-quality craftsmanship coupled with professionalism, thorough follow-ups, and personalized attention. 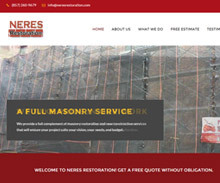 At Neres Restoration, we provide a full complement of masonry restoration and new construction services that will ensure your project suits your vision, your needs, and budget. We specialize in the maintenance, restoration, and tuck-pointing of brick, stone, and block.